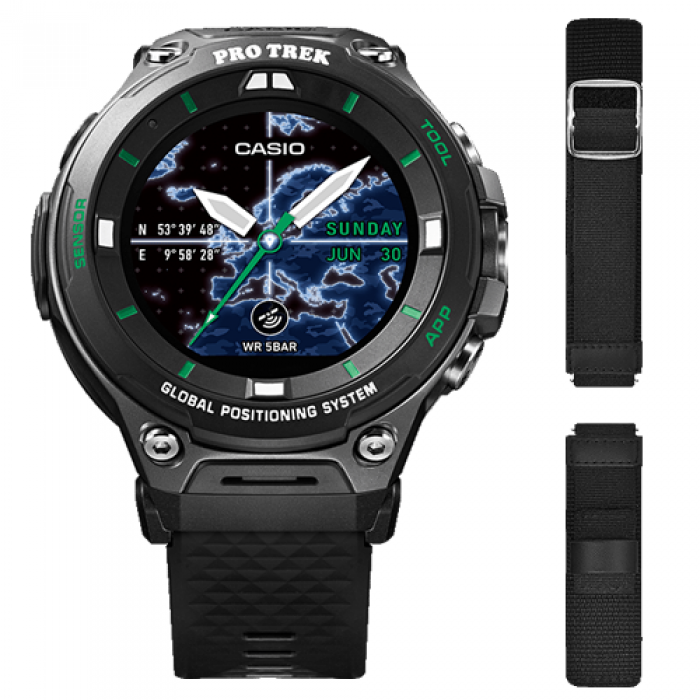 The WSD-F20 Smart watch is the latest addition to the PRO TREK brand of outdoor watches by Casio that are designed for total appeal to outdoor enthusiasts. Equipped with built in low-power GPS and color map functionality, it supports a wide range of outdoor and water activities and can be used in areas without cellular service. Richly-designed and easy-to-read map data can be downloaded in advance and used with GPS data to track the user’s location and add markers, even when offline. The WSD-F20X variation includes a new interchangeable strap. Choose from the standard resin, ideal for comfortable everyday use or a practical textile band which wraps firmly around the wrist, even when worn over heavy clothing so you can check your watch for the information you need without having to roll up your sleeve. 12/24 Hour Format Times can be displayed in either a 12-Hour or 24 Hour Format. Activity App (trekking, fishing, cycling, paddle and snow), The Activity app is a CASIO Android Wear app. It measures the time you spend engaged in different activities. Altimeter Manual altitude correction (auto correction using location information thorough CASIO MOMENT SETTER+, Android only), Altitude graph (past 24 hours), Measurement interval: 1 second (shortest), Measurement accuracy: within +/-75m (+/-250ft), Measuring unit: 1 metre (or 5ft), Measuring range: -700 to 10,000m (-2,300 to 32,800ft), Altitude Measurement to 10,000m: A built-in pressure sensor measures barometric pressure, which is converted to relative altitude up to a maximum 10,000m. Auto Calendar Allowances are made automatically for leap years and months of different lengths. Automatic Time Adjustment The time can also be adjusted manually., The watch will automatically synchronise it's time when connected to a compatible smartphone. Barometer Measurement interval: 1 minute., Measurement accuracy: within +/- 3 hPa (+/- 0.1 inHg), Display unit: 1 hPa (0.1 inHg), Display range: 260 to 1,100 hPa (7.6 to 32.5 inHg), A built-in pressure sensor measures barometric pressure, which is shown on the display. Battery Life All values stated are approximate., With GPS at 6 minute intervals- up to 2 days with location tracking saving on., With GPS at 1 second intervals- up to 9 hours (accuracy priority) up to 25 hours (battery priority), Timekeeping mode only- more than 1 month., Normal use without GPS- more than 1 day. 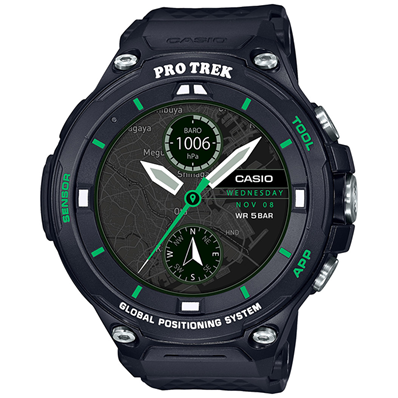 Digital Compass Bearing memory., Gradient calibration, Magnetic declination calibration, Hand indication of North., Measuring Unit: 1 degree, Measuring Range: 0 - 359 degrees, A built-in direction sensor detects magnetic north displaying both this and your current direction on the watch face. Fishing Timer Calculated according to current location, moon hour and age., Indicates the suitability of a specifice date/ time for fishing. Location Memory App Map screen, route screen, selectable map skin, map downloading (offline maps), voice memo, landmark, revisit marks, history screen. Moment Setter App Climbing, trekking, fishing, cycling, paddle and snow notifications), You can use the CASIO MOMENT SETTER+ app to perform watch functions from your smartphone. My Graph Feature My Graph shows a graphic representation of your activities on the current day. It shows the type of activity you performed and when you performed it., Daily activity pattern: Stopped, walking, running, vehicle, calories burned, steps, altitude (highest achieved that day) and workout time. Sunrise/Sunset Display Sunrise and sunset times + direction are displayed., Based on current location, direction accuracy depends on compass. Tide Graph Past 24 hours + next 24 hours., Tidal movements are displayed for your chosen location. Watch Faces 3 favorites, more can be added. World Time Displays the current time in major cities and specific areas around the world.